During the longstanding research on the structure of the image, Georgi Georgiev Jorrras turns the work on a visual object into a ritual. It can be described with Jung’s idea of abstraction as “A form of mental activity by which a conscious content is freed from its association with irrelevant elements”. This type of creative process has a direct impact on the final result realized in paintings, drawings, installations or site-specific projects. In preparing his exhibitions, Jorrras enters a lifestyle that provides a certain type of meditation over the content of each work. This leads to decisions on what materials to use, what intervention to apply to them and when to finish each work cycle. In his latest project, he deals with the invisible meanings behind the surface of an image created based on a subjective visual concentrate from the accumulation of memories, emotional states and observation of the surrounding world. HOTEL is an object-based summary of the contemporary crisis of perception of the image in an overloaded information environment, where there is a serious loss of meaning and depth of the messages for the account of the way of their presentation. The HOTEL marks a territory, provoking questions like – how much has changed the nature of the creative process, carried out in complete isolation in the present intensive, but running through various technical means communication among people. The hotel is a neutral territory for temporary residence. It is not a detail of a specific personal story, but a storehouse of thousands of personal stories of the people who stayed there. It is a place, which has sealed the moments of elimination of subjective individuality, in an interior, created and arranged by someone else, with portable personal belongings that come and go along with the tenants. The hotel is a museum of footprints that people leave in their daily routine – material traces of emotions, experiences, personal rituals, forgotten belongings, odours, sketches accidentally scratched at impossible places … Even after the hotel rooms are ready for the next occupant, a careful examination will find signs of somebody else’s story. The collection of these signs itself constitutes a global human story, which is situated under the seemingly flawless surface of sparkling white sheets with straight edges, starched towels and glasses covered with cellophane cases. As a random photo of a place where something strange and unexpected has happened, which can be seen only if we decode the ordinariness of the image by technical means. Life in the hotel seems to stop the course of personal time, a place without time, without personal meaning, an accidental shelter, imitation of home or the idea of the perfect home, a last stop where the routine of everyday life temporarily has no power over man. Therefore, the roles, which each person gives to this space are dictated by their own perceptions and develop mostly in a mental reality. It depends on the models we construct making sense of the visual stream whereby we come to know reality. Staying in a hotel room, everyone needs indefinite time for adaptation, creating new habits tailored to an architecture they are not used to, trying to explore new smells, noises, and the palpable presence of strangers next-door, as well as the sounds of their daily lives. The hotel is a border state of residence at a place where the known and the unknown gather in a fluid landscape that has countless different readings. The focus of Georgi Georgiev-Jorrras in this project is to visualize the process of rationalization of the image, and the result is objects with hinted hidden meanings. 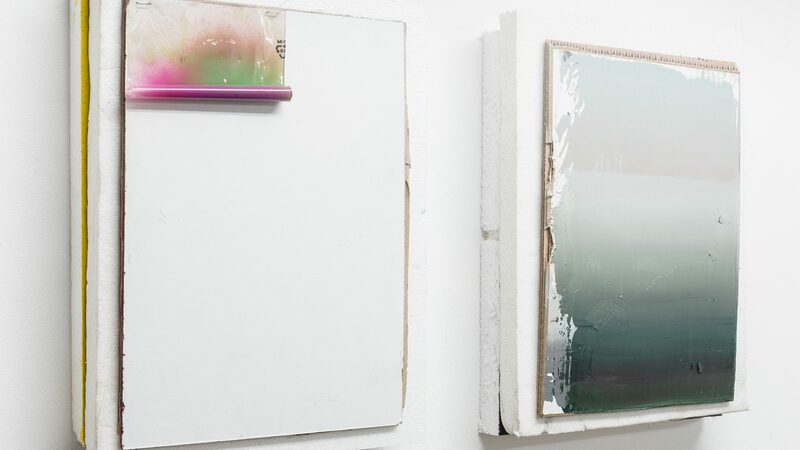 They are marked by physical interventions on the paintings – ruptures, peelings, prints, unexpected deposits of paint, lines carved with sharp objects … This penetration under the drawing surface does not aim at destroying the painting but works as a subconscious reaction in search of its thoroughness and completeness. The images in HOTEL have sealed the physical work for their creation, combining construction and destruction in order to follow the nature of the creative act in its depth, filled with unconscious impulses, contradictions, reaching unexpected harmony through incompatible acts, and above all – finding answers that spontaneously raise new questions.